Here’s to crime! Thanks to the smash success of recent Agatha Christie adaptations, like Kenneth Branagh’s Murder on the Orient Express and BBC One’s And Then There Were None, there’s been a renewed interest in adapting the queen of crime’s novels for the screen. In an ongoing series for Willow and Thatch, Abby Murphy will be reviewing these films and comparing them with the original Christie works (but no spoilers!). 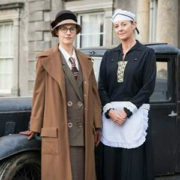 You can find her Movie vs. Book review of Crooked House here. 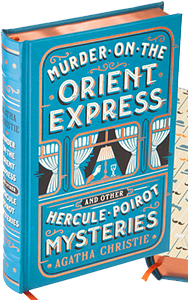 This time she looks at Murder on the Orient Express, first published in 1934. Belgian detective Hercule Poirot has just begun a well-deserved holiday in Stamboul (present-day Istanbul) when he is urgently summoned back to London to conclude a case. With the help of his old friend M. Bouc, director of an international train company, he secures the last berth on the famed Orient Express. But on the second night the train runs into an impassable snowdrift, and in the morning millionaire Samuel Ratchett is found stabbed to death in his compartment. The killer is still aboard the train, and for now, the Orient Express is cut off from the rest of the world. Poirot sets to work, interviewing his fellow first-class passengers and delving into Ratchett’s shadowy past. He soon learns that Ratchett was linked to the Armstrong case, an old tragedy concerning the kidnapping of a young girl, and Poirot suspects this case is at the heart of the murder. But nothing makes sense: not the evidence in Ratchett’s compartment, nor the alibis presented by the passengers. As help approaches, Poirot must discover the killer before they strike again. Murder on the Orient Express is considered a classic of detective fiction, and with good reason. Inspired by Agatha Christie’s own wintry journey on the Orient Express, the mystery is a locked-room puzzle in which only one of the characters present could have committed the crime. The limited cast of suspects and the train’s isolation further focus the narrative on Poirot’s powers of deduction. Additionally, Christie provides the reader with all the information necessary to solve the crime. The short, fast-paced chapters each focus on one piece of evidence, and Poirot occasionally pauses to summarize all he’s learned so far. At times Christie is too heavy-handed with the clues—towards the end she practically bangs the reader over the head with suggestions—but it’s all in service of constructing a perfect fair-play mystery. And the solution is truly ingenious, one that highlights both Poirot’s intellectual abilities and his deep sense of humanity. While the mystery of Orient Express remains timeless, other aspects of the novel date it firmly to the 1930s, for better and for worse. The train’s passengers hail from a variety of countries, and Christie falls back on stereotypes to deepen their characterization. An Italian man is overly talkative and dramatic, while a Russian princess and a Hungarian diplomatic couple are proud and standoffish. The American passengers are brash and loud, even speaking in dialect, while the British travelers are reserved, calm, and brainy. M. Bouc repeatedly emphasizes these stereotypes, insisting that only the Italian man was impetuous and violent enough to have stabbed Ratchett. Meanwhile, Poirot reaffirms these views when he counters, “It is not—how shall I express it?—a Latin crime. It is a crime that shows traces of a cool, resourceful, deliberate brain—I think an Anglo-Saxon brain.” While the gradual revelations of the plot complicate these characterizations, Christie’s emphasis on cultural stereotypes feels outdated and uncomfortable. Still, it’s easy to overlook these issues when the novel’s setting is so iconic. With the rise of cheap airfare came the decline of overnight sleeper trains, and the little details of life on the Orient Express are a glimpse into a bygone age of luxury. There’s the full-service dining car, the adventure of going to sleep in one country and waking up in another, the conductor available at the touch of a bell to provide mineral water at one’s bedside. Christie herself loved travel, and it’s evident in her spare but well-chosen descriptions. The Orient Express of the 1930s may have ended its journey, but it’s brought back to vivid life in the novel. 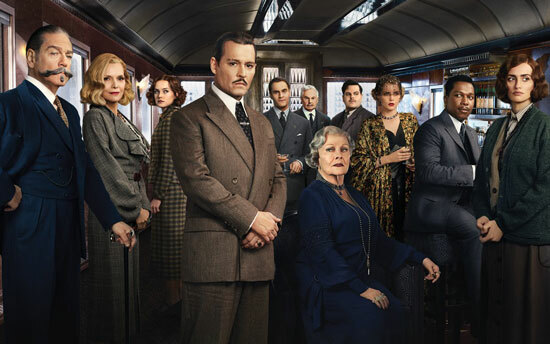 Unsurprisingly, Murder on the Orient Express has been adapted several times for the screen, and you can find out more about all the versions in this previous Willow and Thatch post. Here I’m going to consider the first 1974 film, widely considered a gold standard of the genre, and the most recent outing, the 2017 film directed by Kenneth Branagh. As a disclaimer, I’ll note that I’m particularly attached to David Suchet’s portrayal of Poirot in the PBS Mystery! series, but I tried my best to give each film a fair review. Sidney Lumet’s 1974 adaptation was the first to bring Christie’s beloved classic to the screen. Starring Albert Finney as Poirot, and with Martin Balsam, Ingrid Bergman, Lauren Bacall, Jacqueline Bisset, and Jean-Pierre Cassel, the film was a box-office smash, and even Christie loved it. Her only quibble was with Finney’s mustache, which she maintained was too small for Poirot’s crowning glory. Set in 1935, the film remains remarkably faithful to the original novel, down to specific lines of dialogue. The only major change is the inclusion of a prologue, which tells the story of the Armstrong kidnapping through hazy flashbacks and sensational newspaper headlines before the main action of the film begins. This clearly connects Ratchett’s murder with the kidnapping in a way that gives the audience more information than Poirot has for the first act of the film. It’s an odd choice, given Christie’s insistence on fair-play mysteries and Lumet’s otherwise faithful adherence to the narrative. Once the plot gets going, however, the film returns to the novel’s course. 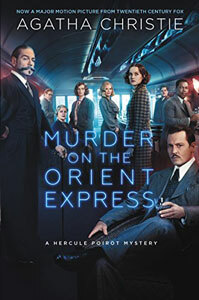 The action is confined to Poirot’s investigation, as he interviews suspects, searches their luggage, and discusses his findings with his companions. This is a cerebral story, one that relies entirely on Poirot’s famed “little gray cells” to deduce the solution, and the film upholds that convention. Still, it leaves room for bits of humor and dry wit to creep in, making it the lighthearted romp that Lumet aimed for. Unfortunately, for a film that’s so focused on the methods of its central detective, Albert Finney’s portrayal leaves a lot to be desired. Finney imbues his Poirot with the requisite quirks—he sleeps with a plastic guard over his mustache, and he drinks his aperitif with a straw—but his manner is stiff and overly formal, even when he’s relaxing with his friend M. Bouc. He questions passengers with an aggression that feels out of place for the refined detective. Even his physical presence (mustache aside) is distracting. Finney, who was only 38 during filming, wore heavy makeup and padding to more closely resemble the short, stout detective, but he more closely resembles an uncomfortable penguin than an actual human being. Perhaps it’s a matter of personal taste or changing film conventions, but I found Finney’s interpretation of Poirot to be almost cartoonish, a decision that felt out of place in an otherwise realistic and enjoyable film. 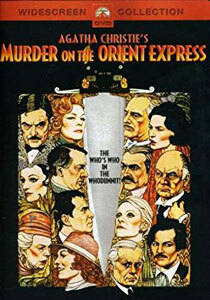 Murder on the Orient Express (1974) is AVAILABLE TO STREAM. Given the commercial success of the 1974 film, director Kenneth Branagh faced an understandable question when he sought to readapt Murder on the Orient Express for 2017: what would his interpretation bring to contemporary audiences? Branagh, who also stars as Hercule Poirot, has stated in numerous interviews that he wanted to remain faithful to the narrative while also delving more deeply into characters’ emotional struggles, including Poirot himself. The result is a darker, more brooding adaptation that makes a few concessions to modern blockbuster conventions. Branagh’s film puts Poirot, and his personal goals of morality and balance, at the center of the story. It opens in 1934 with the detective ably solving a mystery in Jerusalem using only his powers of deduction. He’s a man of intellect, not of action, and his superhuman foresight allows him to stop the criminal with a well-placed walking stick. He’s also obsessively concerned with balance: when he steps in manure, his concern is not for the soiled shoe, but for the unevenness of the situation, and he quickly makes sure to dirty his other shoe. Poirot struggles with the questions raised by the case, as well. He muses on his discoveries to the photograph of a long-lost love, and he visibly wrestles with the solution at the end of the film. This is a painfully human detective, one who’s faced with a decision between legal and moral justice, and he’s more relatable than even Christie’s original. A lot of the film’s press focused on Branagh’s mustache—and to be fair, it is magnificent, something Christie would surely approve of—but his greater achievement is in creating a fallible, sympathetic detective. In other respects this version remains faithful to the arc of the narrative, hitting all the major beats of the mystery, but it changes some character names and adds some splashy action scenes that don’t always feel true to Christie’s cerebral mystery. 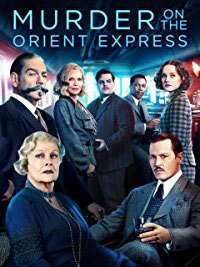 The all-star cast, which includes Judi Dench, Willem Dafoe, and Penélope Cruz, portrays a much more international passenger list, adding to the exotic feel of the Orient Express. Character backstories are changed and deepened, and roles are streamlined to make for a faster-paced narrative. The story’s setting is emphasized to greater effect, as well: an avalanche stops the train on a trestle bridge overlooking a gorge, creating a sense of physical urgency, and Poirot presents his solution in a railway tunnel, where the passengers are arranged in a tableau echoing The Last Supper. The film is gorgeously shot, lavishing attention on the Istanbul setting and the train’s sumptuous interiors, and it’s a visual escape in every sense of the word. But Poirot also chases a suspect across the snowy trestle and fights off a knife-wielding attacker in an open baggage car, and these scenes both come across as concessions to Hollywood action-movie conventions rather than organic additions to the mystery. Poirot famously uses his brain to solve problems, and the first act of the film takes pains to reinforce this standard. So it’s strange and disappointing to see him momentarily become a man of action when, in every other respect, this interpretation of the detective seems to deepen his characterization in compelling ways. Murder on the Orient Express (2017) is AVAILABLE TO STREAM. The Verdict: Read or Watch First? Read first if you’re a Christie purist and you prefer to start with the original. Murder on the Orient Express is a true classic of the genre, featuring an ingenious solution that contemporary critics applauded, and it’s a fast-paced read. Nevertheless, its cultural attitudes feel distinctly old-fashioned. Watch the 1974 film first if you prefer a well-crafted, lighthearted mystery over characterization. Lumet’s film emphasizes the subtle humor of Christie’s novel and maintains the original plot with only one major change. Still, Finney’s portrayal of Poirot left me cold. Watch the 2017 film first if you’re looking for big-budget production value and a deeply sympathetic detective. Branagh’s interpretation focuses on Poirot as a flawed, conflicted human being, without sacrificing the humor or twists of the novel. However, it takes some liberties with the original that feel out of place. Willow and Thatch has an online Period Drama Book Club! Each month we discuss a book that as been adapted, or will be adapted, into a historical, costume or period drama. Read about it here. Abby Murphy writes young adult books about girls discovering their strengths. 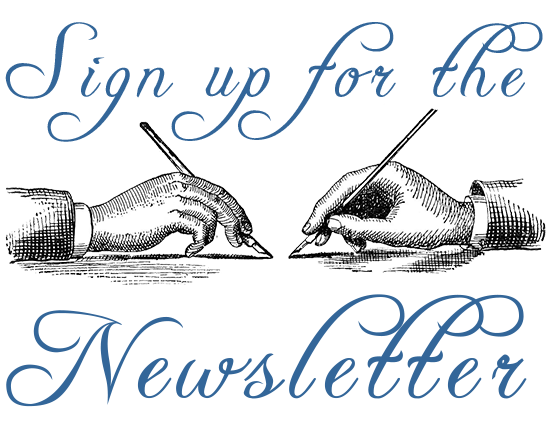 A member of SCBWI and The Historical Novel Society, she is represented by Laura Crockett of Triada US Literary Agency. You can visit her blog here, where she writes about reading, writing, history, and her incurable Anglophilia. If you enjoyed this post, you’ll want to wander over to The Period Films List.